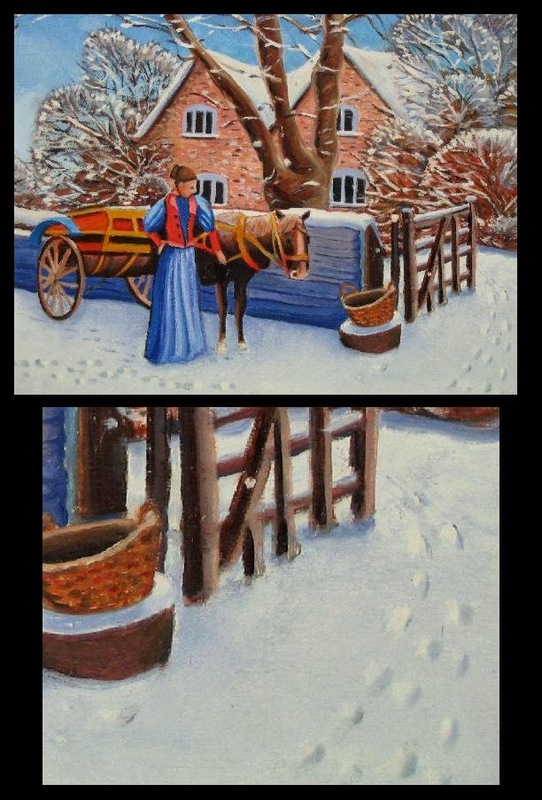 Getting an objective critique on an oil painting is the aim of this article here, which focuses upon an oil painting on panel, showing a wintry scene, a maiden standing beside a horse completed by C Shelley. There is a good sense of light and shadow on the snowy footprints leading through the gate. Close up, we can see how the artist has suggested a three-dimensional aspect to this difficult subject area. As can be seen, the shadows within the impressions give way abruptly to diffuse sunlight. A few dabs of paint are often all that is required to suggest textures in snow. The colour mixes of the snow have also been sensitively portrayed, comprising pthalo blue (a cool blue similar to cobalt), a little burnt sienna and white. A cool blue mixed with a warm colour can bring about an array of china blues, often seen in delicate snow colours. Overall, the painting has an opaque feel, not achieved by glazing techniques, but by the application of neat pigment – that is by loading the brush and ladling on the colour without oil mediums. The result is a weighty feel to the painting that reinforces the wintry atmosphere. However, this has not impeded the artist’s ability to apply detail, which can be seen in the brickwork and the snowy branches. Artists tiring at the end of a painting session might be tempted to smooth out the paint over a blank area of background in a bid to fill in all the gaps, but is not the case here: every inch has been given the same emphasis in a tenacious way. Strategic detail has been applied to the brickwork, the fence and the snow on the branches. This could only have been achieved by the use of fine sables. The painting possesses compositional issues regarding the line of rooftops in the background which causes a disjointed feel. The tree trunk lies at a point of where the two rooftops meet, causing an unwanted focal point. This splits the upper part of the painting in half, causing unwanted visual channels towards the centre of the painting. This could be put right if the tree were to be moved to the left or omitted altogether. The windows’ blank panes have also set up unwanted echoes in the background. Overall, the background is a little busy, causing the eye to draw away from the woman and the horse. As all areas of the painting have been given equal emphasis in treatment, the main subject matter has been delegated a little. Signs of idealization can be seen on the woman’s face and on the horse, which has the same solid feel as the brickwork. As the woman’s face and the horse form the focal point of the painting, attention is required here. A little ultramarine and burnt sienna from a fine sable will bring out the contours of the woman’s face; permanent rose applied thinly is great for suggesting the blush of a cold day. The horse has little sense of form, due perhaps to a poor visual resource. Fur can be suggested by the application of thin paint from a fine sable – not all over, but in strategic places. The horse’s mane, for instance could benefit by the feathering out of a few hair strands. Contours of the horse’s flank can be borne from emphasizing light and shadow. But guesswork is never a good thing. If the photograph worked from does not reveal sensitive detail, the artist may be forced to resort to conjecture. Often, this causes idealization to sneak into a painting, which seems to be the case in the subject matter here. How to beware of idealization in art. The footprints in the snow have been sensitively portrayed along with the snowy colours, which brings a strong sense of a wintry day. Detail has been competently applied despite using opaque paint, which can be a challenge in itself. There are plenty of visual textures to interest the eye throughout the painting. However, compositional issues regarding the line of roofs in the background and the central position of the tree causes the eye to wander to unwanted areas of the painting. There are signs of idealization on the woman’s face, the horse and the windows in the background. This makes good visual resources vital for crucial detail. Read how to enter your painting for evaluation. And then submit your painting via my Oil Painting Medic Facebook page. I agree with most of your analysis of this painting, but what stood out the most for me, was the appearance that the horse was missing it's back legs. While I realize the woman is apparently blocking this viewpoint, I couldn't look at the painting without seeing missing legs. Other than that, if I could paint with oils half as well, I'd be happy! Yes I can see what you mean! Sometimes things looks odd when in fact it speak the truth visually - like the foreshortened view of a pointed finger. It looks like a stub rather than a finger. it is a good idea to check for such odd things in visual resources before using it for painting or it could create a jarring effect in the composition. The artist here could have moved the cart over a bit or moved the horse forward to prevent the 'two legged' horse look.